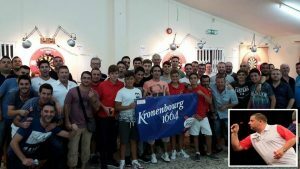 A healthy 48 players took part in our recent main sponsor’s event, the “Kronenbourg 1664 Singles”. Dylan Duo claimed his first ranking title of the season. He managed to take out some top opposition in beating, Shane Israel, 10x National Champion George Federico, Tony Dawkins and current National Champion Dyson Parody, to book his place in the final. Runner-up Manuel Vilerio Snr, also booked his place in the final with wins over, Alex Nunez, Youth Champion Craig Galliano, Takahashi Shimidzu and Justin Stagno to face Dylan in the final. Dylan and Dyson- The match started off with both players getting to a quick start hitting each other with some heavy scores. The game quickly turned 2-2. 5th leg- Dylan hit a 180 to leave himself on D16 which he took out for a 3-2 lead. 7th leg- saw Dyson to leave himself on 140 which he missed on D10 to check out, but then returned to the board to hit it first dart. 8th leg- Dyson started the leg off with a ton followed by a 180, Dylan replied in kind with a 180 of his own, Dylan eventually took out 56 to book his place in the final. This semi final match up, was a very one sided affair with Manuel dominating the match, vs an experienced Justin Stagno. Manuel maintained a healthy standard with Justin failing to produce his best darts in the semis. Final result 5-0 win for Manuel Vilerio. 1st leg- Dylan wins the bull and starts the match. Dylan showed a heavy display of scoring to leave him on 46 which he took out for the first leg (1-0). 3rd leg- Manuel hits double 5 to claim his first leg on the board (2-1). 5th leg- Dylan scores a crucial 134 to leave himself on 32 which he returned to the board to hit first dart (4-1). 8th leg- Dylan takes out a 70 check out to claim the title with a 6-2 vs top class opposition in Manuel Vilerio. Commiserations to Manuel Vilerio, Congratulations to Dylan Duo!